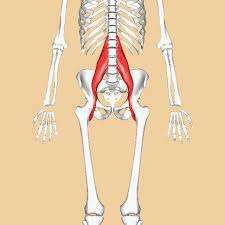 Psoas is part of the Pilates powerhouse. But ironically, but instead of making it powerful, people spend time releasing it, softening it and stripping it of its powerful roles as a spine and hip stabilizer in the body. Psoas is a long muscle that runs the length of the lumbar spine, running through the pelvis to attach to the lesser trochanter at the top of the inner thigh. It interacts with many other muscles of the body and is integral to good human movement. So we shouldconsider how we are conditioning psoas to maintain its supportive role. One of the things we advocate strongly for at Body Harmonics, is paying close attention to how muscles function and the best ways to make them work at full strength and capacity. So, what do you do? At Body Harmonics, we have a 20-minute psoas workout that we give to our clients on a regular basis. And many of us sneak in psoas “strengthening” multiple times during a group class. Here’s one exercise you can use that targets all three major actions of psoas. Stand near a wall in case you want to hold on. Plant one foot on the ground and pull up tall on your standing leg. Gradually lift your left the other leg to 90 degrees or above. Hold for 15 seconds (or work up to this) and lower your leg with control. Repeat on the other side. It’s important to imagine how the thighbone turns in the hip socket to lift the leg. This helps psoas perform its actions well. Picture the femoral head as a ball and as you lift the leg, imagine the ball rolling back and down in the socket. If this exercise doesn’t work well and discomfort increases, lie down on the ground. Keep one foot on the floor with knee bent and bring your other knee above your chest. Keep pelvis neutral and “stir” your left leg with your left hand. Repeat on the other side. Check out the photo at the top of this article for reference.